Join us for our Pilgrimage to Mecha – where I go back in time and catch up on some of the classics and hidden gems of the mecha genre. Whether it was before my time or I simply missed out on them, it’s time for me to watch them and let you know why you should too! It is Universal Century 0079. Based in the space colonies that surround Earth, The Principality of Zeon has declared independence from the Earth Federation and subsequently launched a large scale war on the planet and its inhabitants. The conflict has reached every corner of the globe and space, engulfing the lives of billions in its violence. With its advanced mobile suit technology, Zeon has put the Earth Federation on the defensive. 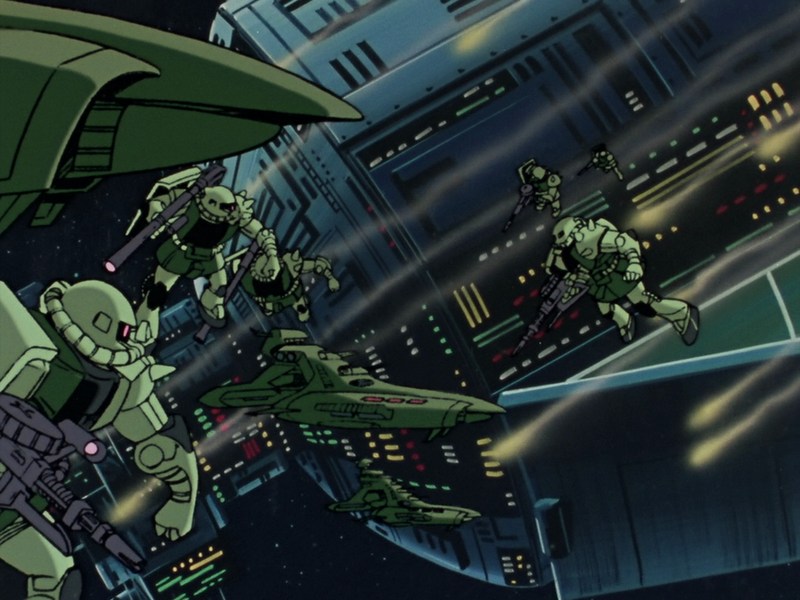 However, the Earth Federation has developed a prototype battleship and mobile suit of their own to combat Zeon, known as the White Base and the Gundam respectively. Zeon gets word of this however and launches a preemptive strike while the prototypes are being delivered to the ostensibly neutral colony, Side 7. Amuro Ray, a citizen of the colony, is caught up in the conflict and is forced to pilot the Gundam to fight off the Zeon attackers. Now he along with the fresh crew of the White Base find themselves in a war that they never wanted to fight in against an enemy that is both viciously cruel, yet undeniably familiar. It’s a testament to the underlying strength of Mobile Suit Gundam’s core that makes it still compelling and engaging even 35 years later. The story of the war between the Federation and Zeon is an intimately familiar one, rife with the kind of politics that we’re all too familiar with today. Good intentions are tainted with extremist rhetoric. Monsters on both sides of the war seek to profit from the suffering and destruction of billions. Innocent people are caught in the middle and forced to adapt to survive. Mobile Suit Gundam’s ability to play with these themes in an era where your average robot pilot was dealing with a race of intelligent dinosaurs or his insane grandpa only further exemplify its accomplishments. Watching Mobile Suit Gundam itself was something of a surreal experience. Being relatively familiar with Yoshiyuki Tomino’s signature directing style, I had some knowledge of what lie in wait for me. And in some ways, I came away surprised in ways I did not expect. While Tomino of the 21st century might be known as an eccentric old man with an absolutely bizarre sense of human interaction and society as a whole, the Tomino who guided the original Gundam was something of a visionary in a genre that had yet to witness anything quite like it. Zeon’s dogged pursuit of the White Base carried a kind of tension I had not felt in a mecha anime in quite some time. Amuro Ray was a poor pilot only saved by the sheer technological advantage of the Gundam, and it constantly felt like Zeon was one lucky strike away from blowing it all to pieces. It excited me in ways I didn’t expect from a show as old as Mobile Suit Gundam. And throughout its entire run, it never shied away from showing the heavy cost of war. Characters are introduced and then later killed off with little fanfare. Even the most charismatic and competent aren’t spared by the cold inevitability of combat. In fact I was surprised by how much I actually grew to like many of the characters. 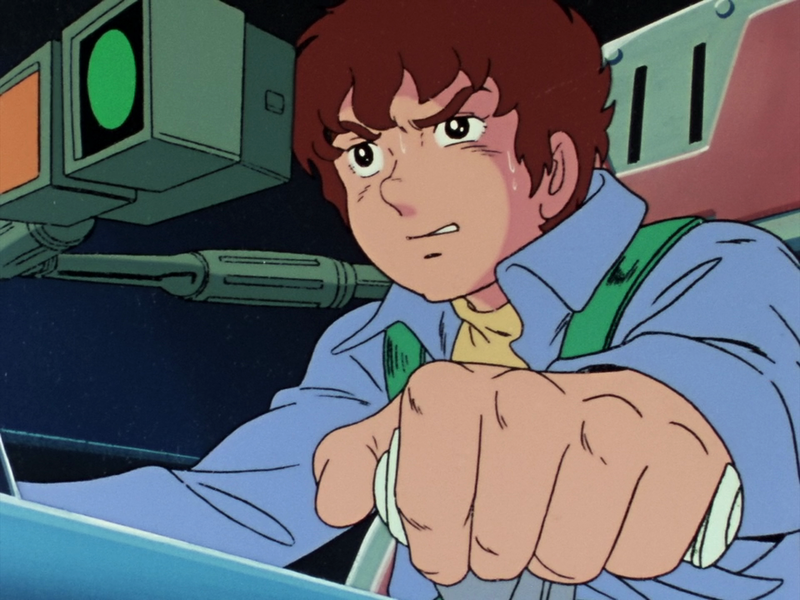 Amuro Ray is perhaps one of the original reluctant mecha pilots in the genre, and his obstinate insubordination, while annoying, felt quite real within the context of the show. Of course a 15 year old kid is going to be mentally scarred by the experiences of live combat. What kind of mad man would get into a 20 meter tall robot to go fight other 20 meter tall robots? And despite all that, he grew into one of the most capable mecha pilots the genre has ever seen. While I wholly acknowledge that much of his actions in the war were just repeated stock footage for the sake of padding, goddamn. 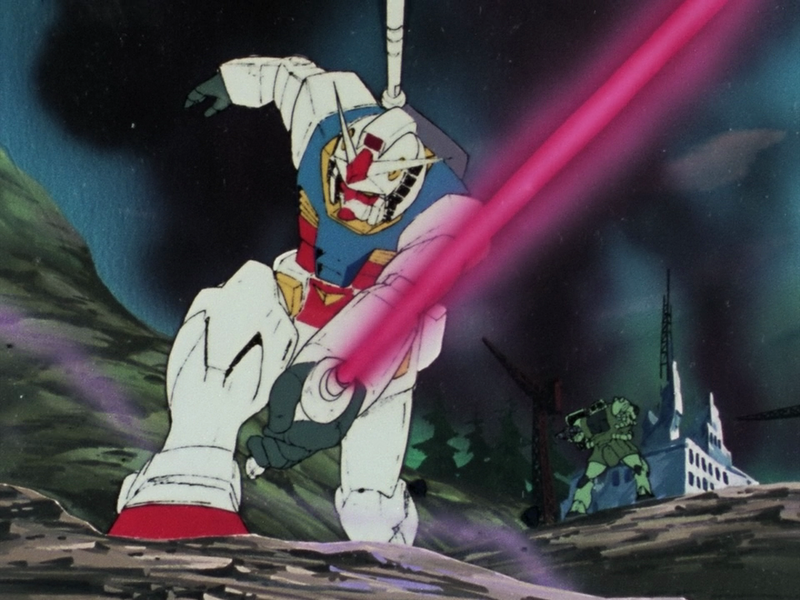 For all of his faults, Amuro is a stone cold killer who always gets into the robot. For that, he’s earned my respect. The rest of the cast managed to be equally engaging in ways I didn’t expect. I went into the show expecting men like Bright and Ramba Ral to be cool, but simple characters. Instead, I got Bright Noa, a man too young for his position, trying to hold together a crew of children and nutcases, eventually resorting to violence and intimidation to ensure the survival of the people under his command. Then you have Ramba Ral, a consummate soldier fighting for a losing cause. And of course a man as noble as him in a war this cruel would end up as nothing but a pile of ashes, destroyed not by the enemy, but by the political bickering of his own superiors. Hell, even guys like Kai Shiden, who goes from a selfish pessimist into a grief-driven ace, showcase Mobile Suit Gundam’s fantastic characterization. That said, it’s not without its faults. 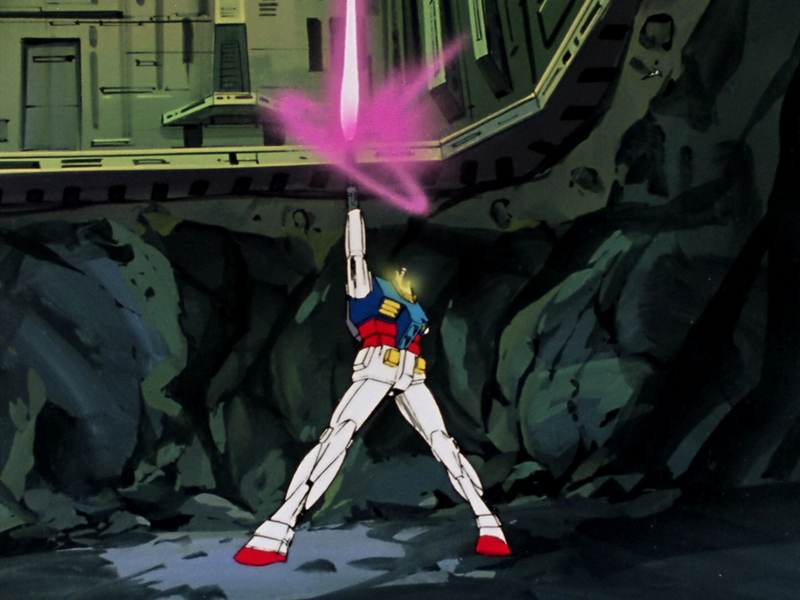 Even for a show from 1979, Mobile Suit Gundam is a rough piece of work. The titular mobile suits are constantly off model, the animation gets lazy in some of the most hilarious ways, and overall, there’s a definitive lack of polish to many parts of the show. Some of the fights feel aimless in nature, as Zeon unleashes its new prototype (often aquatic-based) mobile suit of the week in some half-hearted attempt to kill Amuro Ray and the White Base. Throw in how ridiculously easy the Gundam puts down these incursions, and some of the tension that pervaded the early parts of the show get lost in the middle. 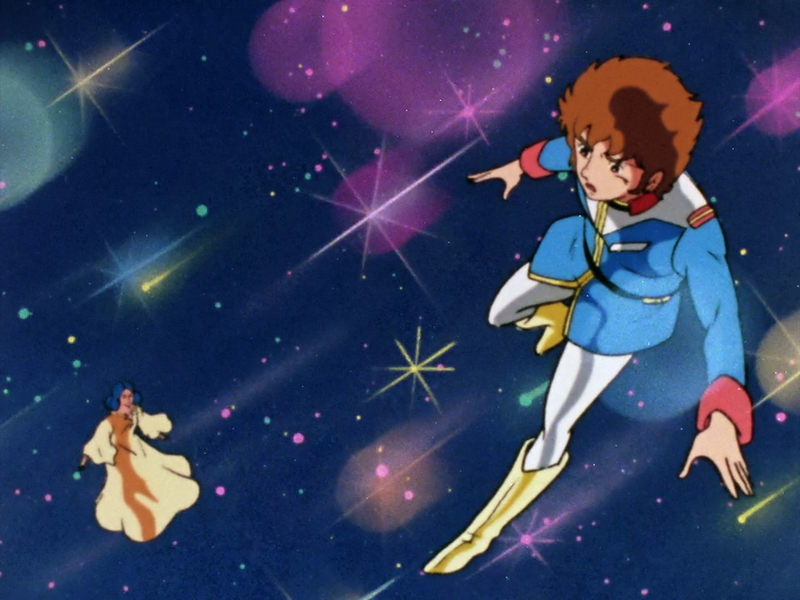 Additionally, while the finale is a fantastic giant space battle that everyone could have hoped for, much of Mobile Suit Gundam’s final stretch becomes a surreal pseudo-intellectual romp through the mind. The sudden introduction of Newtypes in the last third hamper the show in ways it can’t recover from, and the everlasting legacy of its autistic space psychics continue to tarnish the franchise to this day. 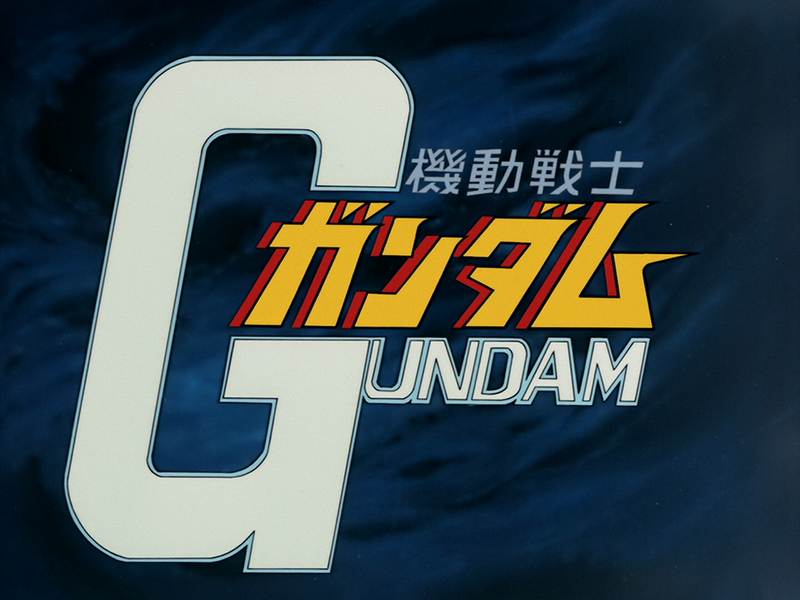 Overall though, I came away from Mobile Suit Gundam extremely satisfied. I now understand why it’s become such a cultural icon. It’s not just that it was one of the first of its niche, it was also one of the best. With writing years ahead of its time and a willingness to tackle themes beyond the standard fare of its peers, it was a glorious outlier in its time, and continues to be one even to this day. Mobile Suit Gundam is a strange beast. Despite ushering in what is often called the real robot genre, it retains many of the traits of its predecessors. Funnily enough, the show itself isn’t even that realistic. The robots are often colorful and goofy, there’s transformations aplenty, and enough new suits introduced on a regular basis to ensure a good steady supply of toys. Despite that all, watching it made me realize how important it was as a pillar of the genre. Gundam is a very old franchise. Mobile Suit Gundam is a very old show. Watching it was a real slog at times, between its extremely shoddy production values and antiquated notions. And yet at the same time, watching Mobile Suit Gundam made me realize both how much and how little the mecha genre has changed. Protagonists unwilling to accept responsibility, sympathetic enemies whose motivations are just as human (or in the case of certain poorly written shows, even more human), contrived situations that allow a wide variety of niche robots of varying designs, and other aspects of modern mecha have existed for over 30 years. In fact, I’m almost insulted by how little the genre has evolved since Mobile Suit Gundam. How the hell is something like Aldnoah.Zero praised in the current zeitgeist when it’s literally accomplishing the same things the original Gundam did over three decades ago, but doing it worse? How are we still playing with the same tropes and themes that Tomino played with so long ago? I laugh at the sheer absurdity of some of Tomino’s modern work, but goddamn, at least he’s trying something new. 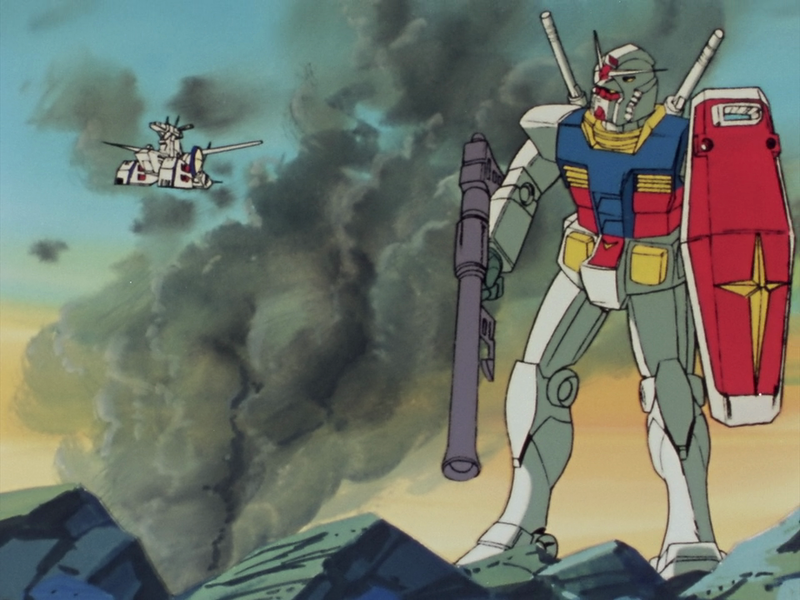 Yes, some of those tropes are iconic and inherent to the genre, but I find myself immensely disappointed by the mecha genre as a whole after realizing just how much the original Gundam did, and how much of modern mecha merely imitates it rather than expanding on it. Gundam set the example, but it shouldn’t have become the bullet point instructions for all that followed. And so, despite its undeniable faults and its very apparent age, I believe the original Gundam is something every mecha fan should watch, if just to understand where so much of it came from. While I hesitate to use terms like “real robot” and “super robot” liberally, I do think it’s important to recognize how much Mobile Suit Gundam did to establish and legitimize the “real robot” genre. In fact, I almost fear that people treating Gundam as the progenitor of the “real robot” genre has hurt it in the long run. With space psychics, a totally made up power source, and robots that completely defy the laws of physics, Gundam isn’t very real at all. And yet, when compared to its peers, one comes to realize it’s the thematic elements that make it so relatable. I think Mobile Suit Gundam is worth watching both because it’s a legitimately good story, but also to see how little so many of its descendents have deviated.